Address: No. 3, Jiye Road, Songxia Industry Park, Songgang, Nanhai Area, Foshan, Guangdong, China . Light weight : 10-14 kg/m2 . 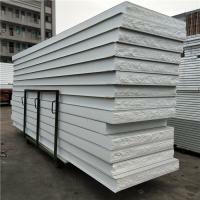 Polystyrene(EPS) sandwich panel is a new type of construction panel which made of outer layer both side of prepainted steel coil and inner layer of polystyrene by computer -controlled color steel shaping machine and covered with high -strength adhesive .The connection can be two ways , one is drilling on the panel and jointing with bolts and nuts , the other is opening groove on the panel and connecting with bolts . Wall panel and roof tile has 50mm , 75mm , 100mm , 125mm , 150mm foam with 0.326mm , 0.376mm , 0.426mm , 0.476mm steel sheet widely use for prefabricated house , construction site , bulidng , warehouse , worker camp , office ect . It is low cost and thermal insulation , waterproof , sound insulation .The fix width of wall panel only has 1150 and 950 mm , 840mm and 1050mm for roof tile , length is no limte but less than 12000mm because of the transportation . The surface metal coat could adopt galvanize aluminum steel sheet , galvanized aluminum zinc color steel sheet and the galvanized color steel sheet . Polystyrene foam is green environmental protection, economical and practical; With thermal insulation, heat proof, moisture proof, waterproof and sound insulation , the life span more than 10 years, it is not bad use the polystyrene foam (EPS) sandwich panel for cold storage and clean room except for construction building. Q1 : Are you are manufacturer or trading company ? Q2 : When do you ship the goods if we place an order with you ? With 2-10 days after received the payment . Q3 : Can we have the samples , is it free ? Yes , we can give away the small sample but no including the freight charge . Q4 : What payment term be used for you ? TT , L/C at sight . As a rule , 30%TT deposit after sign the contact , the balance should be paid before delivery . Q5 : How many quantity put into a 40HQ ? It depends on the item itself (Length , width , thickness ) , but usually 63 cubic meters for a 40HQ .